President Abdel-Fattah al-Sisi is demanding Egyptians lose weight. In televised comments earlier this month, the general-turned-president railed about the number of overweight people he sees and told Egyptians they must take better care of themselves. He said physical education should become core curriculum at schools and universities and suggested TV shows shouldn't let presenters or guests on the air if they are overweight. It was the typical style of al-Sisi, who sees even the smallest minutiae as needing his shaping and weighs in on anything from road building to filmmaking, often while scolding and haranguing Egyptians to correct their behavior. But al-Sisi's critics said he was fat-shaming and taking an elitist approach to a problem whose roots lie to a large extent in poverty. They also criticised him for not offering concrete plans to combat obesity and spread fitness. Prices for food - particularly fruits and vegetables - have spiraled because of economic reforms introduced by al-Sisi, often making cheaper junk foods more appealing. No one disputes that Egypt has a weight problem. One in three Egyptians suffers from obesity, the world's highest rate, according to a 2017 global study by the University of Washington's Institute for Health Metrics and Evaluation. It found 35% of adults - some 19 million people in the country of 100 million - are obese, again the world's highest rate, as well as 10.2% of Egyptian children, or around 3.6 million. Al-Sisi, who often tells Egyptians they must buckle down and accept hardships to get through hard times, said they must change their habits to shed the fat. "The second I walk into any place I look at things you cannot possibly imagine I would notice; and I ask myself 'what is this? Who are these people? Why are these people not looking after themselves?'" al-Sisi said in the December 15 comments. He derided Egyptians for not walking enough and, laughing, turned to his prime minister - seated next to him - and told him not to put on weight. In social media, possibly the only platform of relatively free speech left in Egypt, the response was more critical. Some said al-Sisi was removed from reality or speaks his mind without weighing his words first. A flood of jokes spilled forth on Twitter and Facebook, playing on the risks of being too fat under a president whose security forces have arrested thousands in a widespread crackdown against dissent. Al-Sisi's comments "laid bare a great deal of elitism," said novelist and socio-political analyst Amar Ali Hassan. "They are symptomatic of an authoritarian ruler who's convinced he's on a mission, that he alone knows what is in the public interest while everyone else is ignorant of the lofty goals in his head." Since taking office in 2014, al-Sisi has depicted himself as trying to refashion Egypt into a prosperous, stable and modern nation. But he has made sure there is no one influential or brave enough to question any of his policies or offer alternatives. He once angrily told Egyptians to listen to him alone and shouted down a lawmaker who suggested delaying the lifting of subsidies. This month, he declared he did not allow feasibility studies to be the deciding factor on the multi-billion-dollar projects he has embarked on. 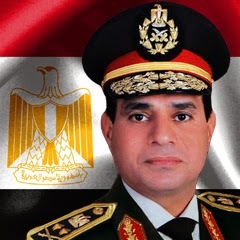 But al-Sisi has also sought to quash any opposition, jailing thousands of Islamists along with secular pro-democracy activists, silencing critics in the media, reversing freedoms won in the 2011 uprising and winning a second term in office this year after authorities jailed potentially serious challengers or intimidated them out of the race. Some longtime al-Sisi critics commended him for drawing attention to the need to fight obesity. But they pointed out that Egypt's poor majority cannot afford to eat healthy when a diet of sugar and carbs is cheaper. Mohamed Zaree, another rights lawyer, said al-Sisi needs to enable Egyptians to lose weight rather than ordering them to exercise. Its difficult to know how to respond to this news item except in pictures so the 30% illiterate and poor benighted Egyptian citizens can make uo their own mind about fat cats or the profound pressures of world leadership. This is the Imperium 5 years ago – or so his ‘spontaneous’ simple friends campaigning for him said to get people to vote for him so it must have been the truth and could not have been a lie (Source of the images Hawass Pty Ltd Bermuda, Military Intelligence Ac, PIN code General Kamal) . The above photo might be touched up – so to speak – if you remember the 40 gallon hair paint and the 20 kgs that Mubarak (Assad, Qadaffi, Bashir of Susan, that horror Zinan of Tunisia, Sadam Hussein and many members of the Saudi Royal family and most of Lebanon generally) applied to his face not to mention the truss/girdle and the al Ahram twisting world Summit photos to have Mubarak leading the leaders of the world. The above photo was the infallible truth 5 years ago on the basis of which 40 million people elected a young, handsome and very thin man, Therefore the fat elderly Imperium today had either bloated himself in a disgraceful and uncontrolled way way in a short time or Egypt is oppressed by an fat imposter - which sort of makes sense in an Egyptian sort of way. Avoiding side profiles is always helpful. Here is a side profile of the Imperial embodiment - so to speak, of Egypt 16 months ago. Here is another glancing view – or blow. Apparently Facebook and related are completely riotous on this matter – mainly from young Egyptians – and Sisi runs the risk that the western media will stick for a few more days to the view that he is a fool and his people agree. Being fat, or even thin, isn’t the only PR problem in public life as some know well. Being ‘smaller that Trump’ is a phrase with many meanings all of them bad. But being smaller and considerably fatter than a US looser and his own Imperial Generals is more that the incarnation (its Christmas so the word has an unintended and perverse use here) of the Imperium can take. Maybe is was a non-corset day. 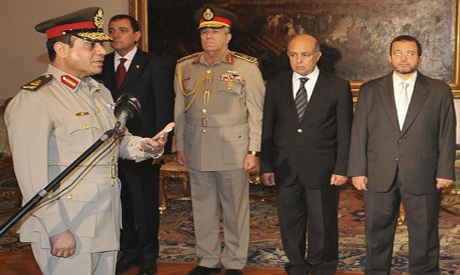 I wonder whether that tall Egyptian General on the still has a job or maybe he’s been cut down to size. The solution to this awful attack on the stature of Egypt - so to speak - is the Mubarak- Sarkozy Imperial Strategy backed by war games and intensive blank fire. Elevated shoes - Bally of course - and maybe a Mubarak corset. Violent seizure of all non-approved photos. No photo profiles, get al Ahram back to its usual dirty tricks - which it never stopped doing - and doctor all photos on height and weight and prohibit the world from taking any independent photos. A large security contingent of 500 might be needed to enforce this on the ground in realtime. Finally the standard Egyptian response to all things including poor service in restaurants. 20 years jail via a military court - no appeal. One of these people are thin the other is not. Clearly Egypt has a huge and expanding obesity problem related to the types of food eaten, the amount of food and the lack of exercise. As usual the President misses the real problem which are the financial, human and economic costs of heart, blood, stroke, cancer and Type2 Diabetes. In the next 20 years this will hit Egypt like a Tsunami. The screamingly obvious, ignored by Sisi and turned into a typical Egyptian status/appearance issue, is that fat people will die, get sick more often, be more likely to be physically disabled for a short or long time, earn less money and cost the state a lot and lead to higher taxes on everyone. Their families will suffer emotionally and economically. It’s a simple and direct story. The moral blind spot of Sisi or is it a Corona, is that about 1/3 of Egyptians suffer from some form of malnutrition, its worse in rural and poor areas, its getting worse and it has profound and life long effects on babies (disease, deformity low IQ, stunting etc) if their mother is malnourished during pregnancy and they are inadequately fed/inappropriately fed for the first 5 years The 900,000 staff of the Ministry of Health do little and again I will post on this another time. I agree obesity is a serious and quickly developing problem but so is malnutrition. Is Egypt so robotic it can’t deal with both at the same time? Unfortunately I think yes. Totally unbelievable!! But I suppose when bread is one of the only staple diet foods people will put on weight. The foods that do you the most good are of poor quality and are expensive to local people. Is the family allowances for food still hit and miss? That was a bit of a help but families sometimes got it and in a lot of cases they received nothing to aid the children whatsoever. Also another thing we noticed while there was the incredible intake of sugar in drinks people used, I would think Diabetes is fairly rife. Another thing we noticed was the men were worse than women for being over weight, you may think that is rubbish but because of women's lack of foundation underwear, and the amount of babies they churn out every year for their dominant husbands, their weight is normally a false factor and is normally caused by child baring, and the lack of knowledge in aiding their bodies back to peak condition, we used to feel sorry for the women not being able to purchase modern things to aid their figures, and I suppose if there were aids they would be expensive and beyond their pockets, and then again their husbands would go ballistic if their wives looked attractive to others besides themselves. I hadn't realized you were such an expert on Egyptian women's underwear MT do tell us more. El Sisi has a job on his hands if he expects Egyptians to "walk" when I tell my Egyptian friends that my family and I used to often go for walks they are horrified. Egyptians on the whole don't do walking. Very sensible in Luxor temperatures, plus they are too tired from malnutrition and often doing at least 2 jobs if they can to make ends meet. PM call with President el-Sisi of Egypt: Prime Minister David Cameron spoke with President el-Sisi of Egypt about working together to defeat terrorism. Did the British Prime Minister inform Sisi of the $30 BILLION + deal for arms, it had signed with Doha. 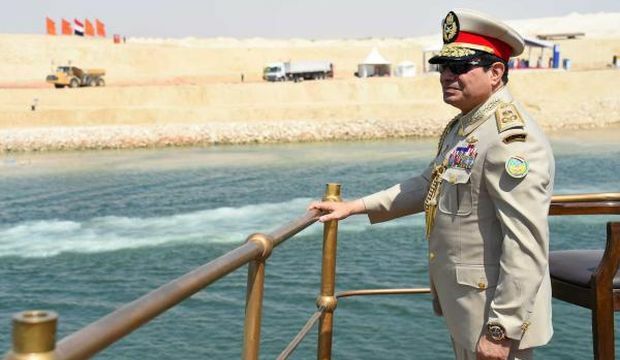 Egypt's army chief General Abdel Fattah El-Sisi said on Sunday that protecting the “people’s will” is a greater honour than ruling the country.